Are you renewing your Autodesk Subscription software on a monthly basis? By changing to annual or 3 year licenses from Creative Tools you save nearly 40 % of the total annual license cost. The table below shows a price comparison between monthly, annual, and 3 year licenses of Autodesk 3ds Max Single-User license as an example. 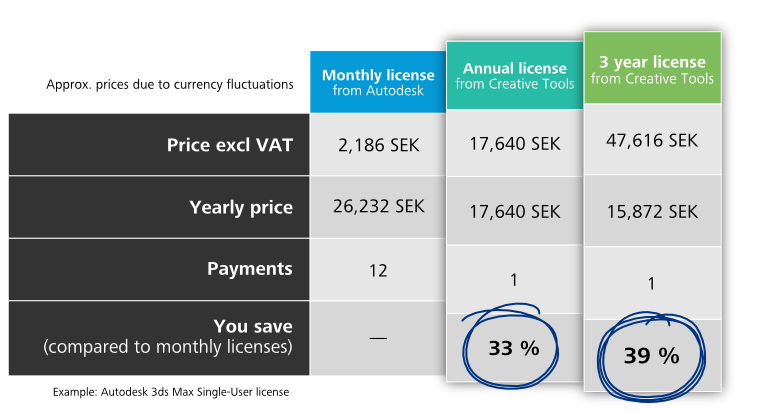 Regardless of what Autodesk software you use, monthly Subscription license holders can save about 30 % by changing to Annual Subscription, or almost 40 % by changing to an 3 year license. Less administration and more time savings come as a bonus. Please contact us for more information on how you can save money today! Why purchase Autodesk Subscription from Creative Tools? Autodesk® Mudbox® software is a cost-effective digital sculpting and painting solution. Mudbox provi..
Autodesk Arnold is an advanced Monte Carlo ray tracing renderer built for the demands of feature-len..
Autodesk Media & Entertainment Collection includes digital content creation tools for efficient ..
Autodesk Product Design & Manufacturing Collection is the best way to access the most essential ..
Autodesk® Alias® Design, is the base level Alias 3D design software for industrial designers who con..
Autodesk Inventor LT and Autodesk AutoCAD LT bundled at a great value.Autodesk SubscriptionAutodesk ..
Autodesk® AutoCAD® Revit LT Suite can help smaller architecture firms transition to Building Informa.. The Flame Family has been trusted by the best artists for over 25 years for 2D/3D, Compositing, Edit..
Shotgun® software is a secure and scalable production tracking, review, and asset management toolset..
Autodesk® Inventor® software provides engineers professional grade design and engineering ..
Autodesk® Inventor® LT software provides engineers professional grade design and engineeri..
Autodesk® MotionBuilder® is a 3D character animation software for virtual production that helps you ..
Autodesk® Smoke® is a MacOS compatible video effects and editing software that brings editing and VF..
Autodesk® Revit® software is built for Building Information Modeling (BIM), helping professionals de..
Autodesk® VRED™ Design software, part of the Autodesk solution for Digital Prototyping, is an intera..
Autodesk® VRED™ Presenter software is part of the Autodesk solution for Digital Prototyping and an i..
Autodesk® VRED™ Professional software, part of the Autodesk solution for Digital Prototyping, helps ..
Autodesk® Maintenance Plan is an add-on that helps you effectively maintain your perpetual Autodesk ..